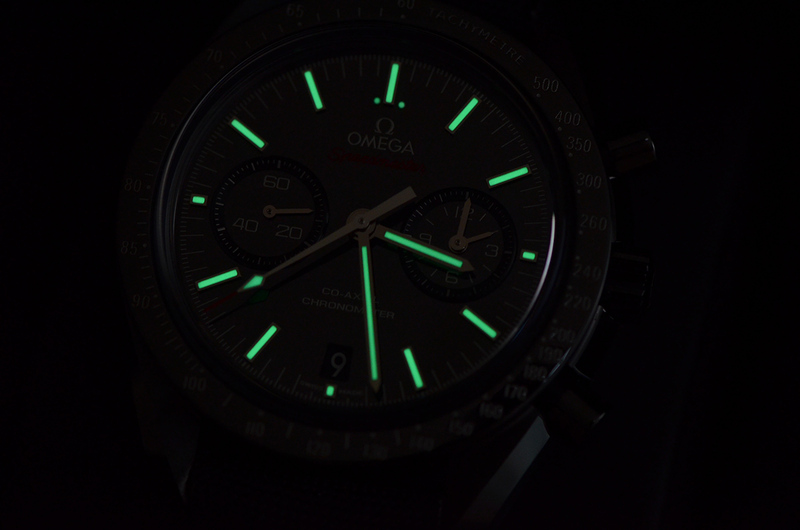 TimeZone : Omega » I'm done with Omega. Sorry about the seemingly provocative subject line. 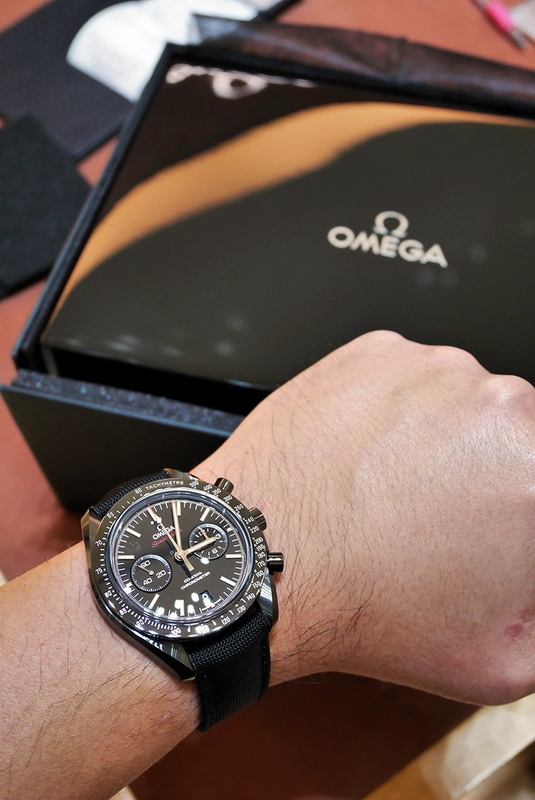 But it's too long to say: "I finally got the last piece of the puzzle that would make my Omega collection complete and end the unreasonable desire to buy more Omega watches, especially when I am wearing only a few watches in rotation." Let's begin it slow with a refresher at the small get-together event at a local Omega boutique. This is after spending 40 minutes circling the parking lot for an available spot on a Sunday afternoon! Main course is served. The new pieces this year are shown but only the white gold Tresor is a production piece and ready for sale. You must have seen these before from the other posts but let me show my version just in case you can see something you like or dislike about the watches from different photographs. I have always wanted to see the De Ville Tresor in person. 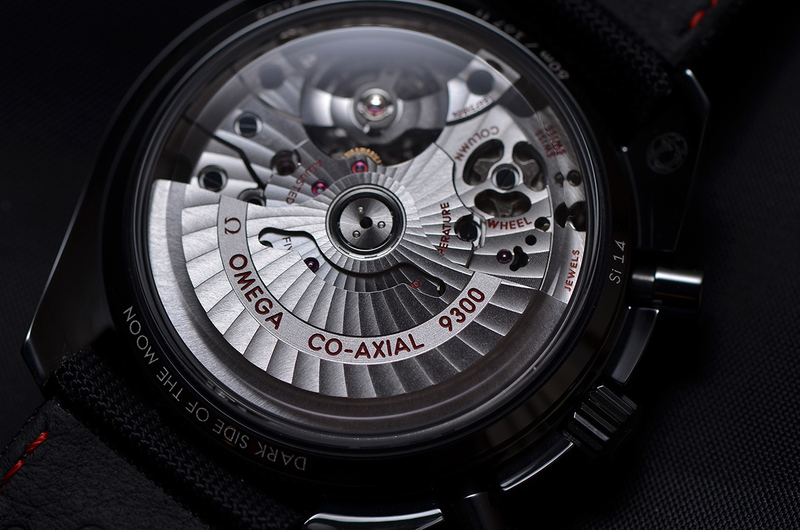 I wanted to know how the new hand-winding, anti-magnetic movement compares to their self-winding siblings. And how elegant the watch would look on the wrist. Although I am not a gold person, this rose gold with brown strap combo moves me more. I also wonder how the dial would look up close but I didn't have my macro lens with me. Here's a better shot of the movement. This is a show piece only and without plastic wrapping. Sorry about the lighting and misleading white balance. The watch does feel good on the wrist. There is some heft and presence after all. This one I cannot remember if it is titanium and gold or steel and gold. It is not on my wishlist so I did not study it enough. The all-steel version is my choice. It looks every bit like the standard Omega press image. Notice the smudge of fingerprint on the polished center link. I intentionally left it on to show you the effect. Now the smudge is wiped out and the watch is on wrist. Good size indeed. And it is not thick at all. However, in the end, I went home with this!!! Yes, after a couple of misses last year, I finally get to bring the Dark Side home. The black color of the ceramic body makes it look smaller than the indicated 44.25 mm size. My wrist is only 6.5" and I can wear it no problem. 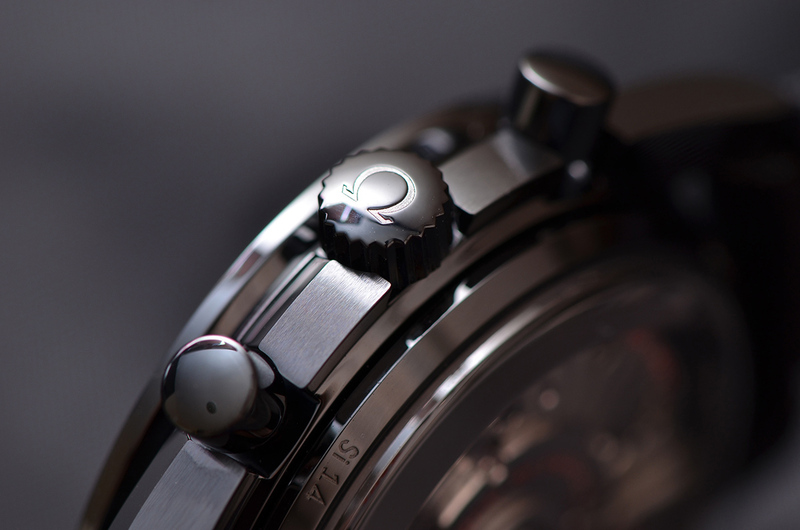 The annoying "ZrO2" designation above the center of the dial is not noticeable most of the time when the watch is worn. It is a seriously overpriced and seriously handsome timepiece. 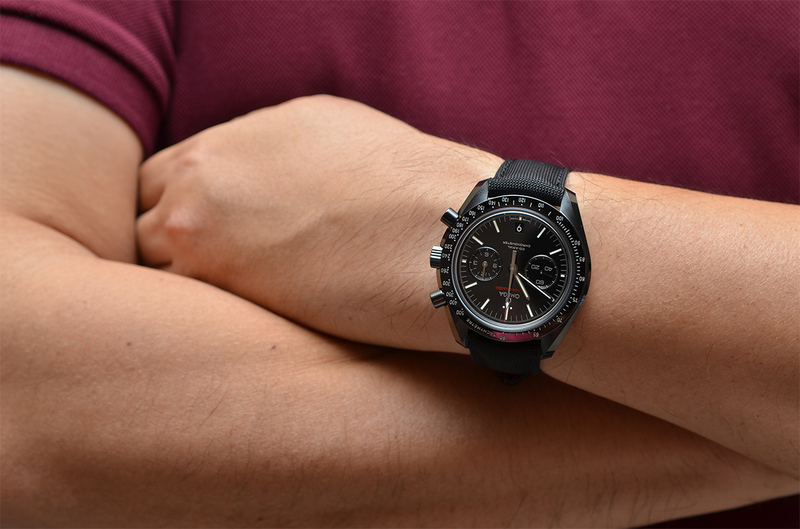 A full ceramic bracelet would have justified (at least for me) the price jump from the standard Speedmaster 9300. But I guess I have to suffice with the given fabric strap for the time being. 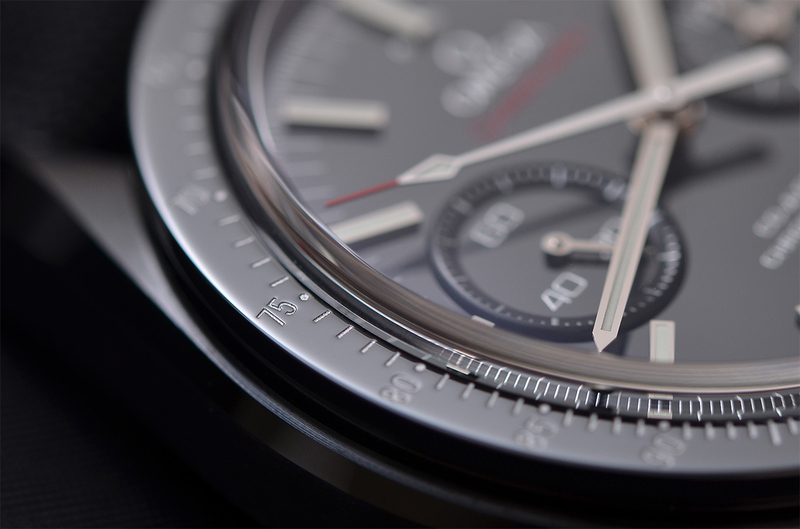 I remember feeling a bit awkward with the wide spacing between the two subdials when the Speedmaster 9300 came out. I didn't quite agree with the look. That's why I find it weird that I am complaining about the same when the watch is delivered in black. 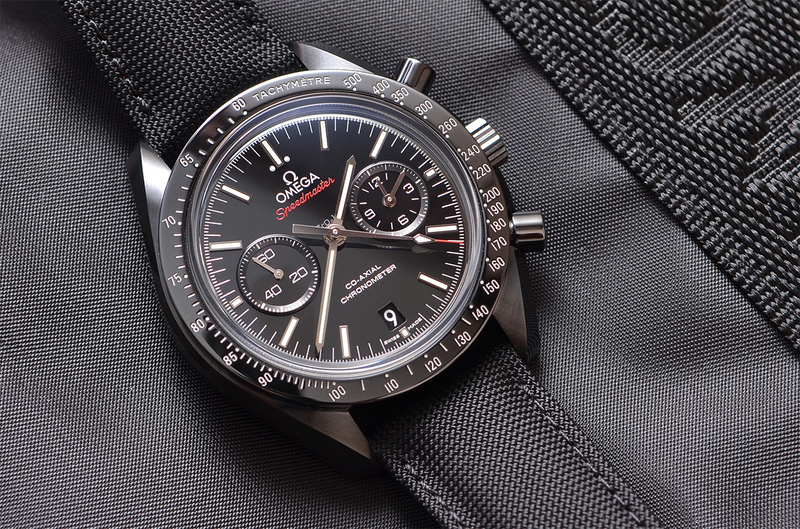 This is not my first Omega with ceramic bezel but first without a stainless steel rim on the outside. The all-black look is intriguing in a way ... mysterious. Sapphire crystal is treated with anti-reflective coating on both inside and outside. It works wonderfully you can feel like touching the white gold hands and indexes above the black ceramic dial here. 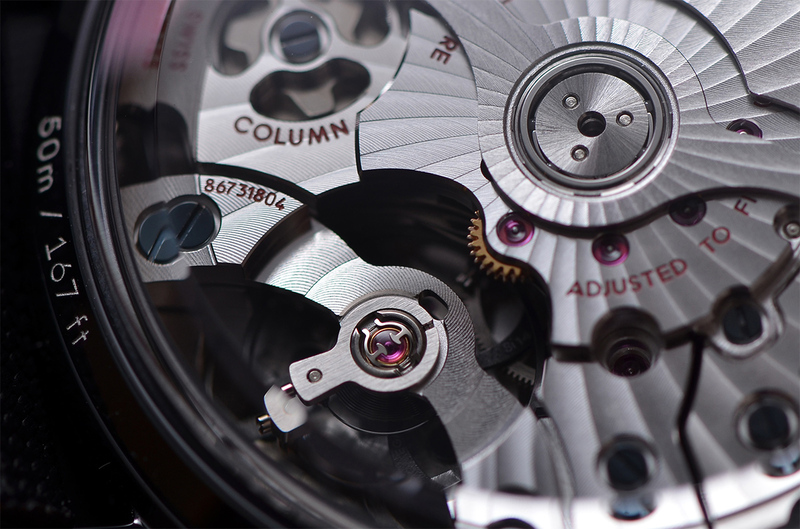 Note that the central chronograph hand is the only one not made in white gold according to the spec sheet. This pic also serves to highlight what I feel is a shortcoming of the Dark Side. The two small hands in the chronograph counter at 3 o'clock are quite similar. Telling the two apart in a quick glance is not always possible. And sometimes they are both blackened by the car's roof, for example, or when your head is directly over the watch and the dial facing you squarely. You would need to rotate the wrist a little so these hands reflect some light and you can read them. 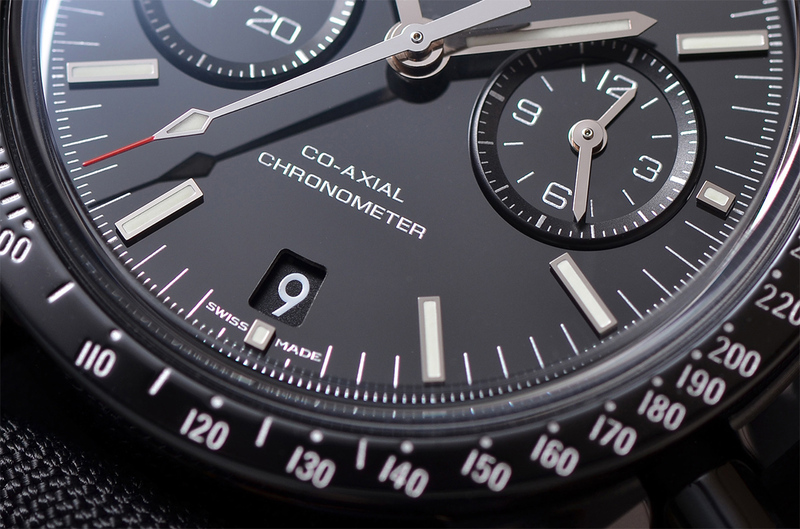 With that said, I believe most people buying this piece wants it for the good looks and do not intend to use the chronograph function in a serious way. It's a cool watch and that's it for the observers. As I said, a full ceramic bracelet would have justified the price difference for me. 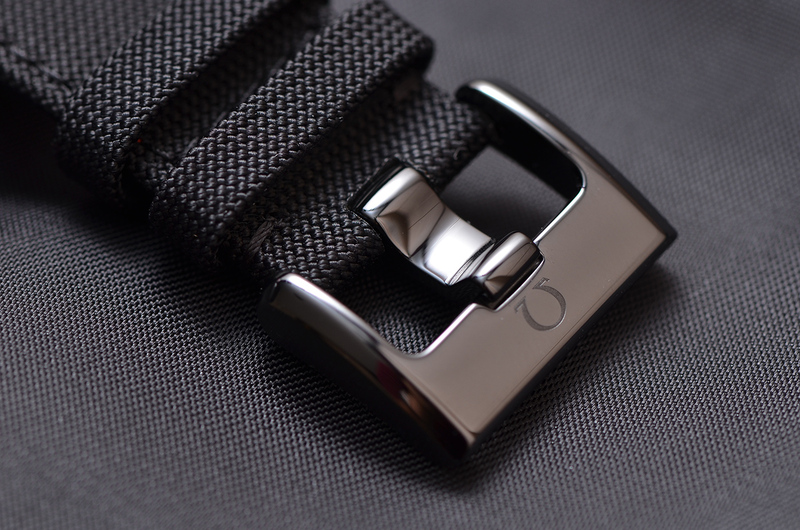 I will report later how this fabric strap fares over time. This is the back of it and I don't think it likes water. 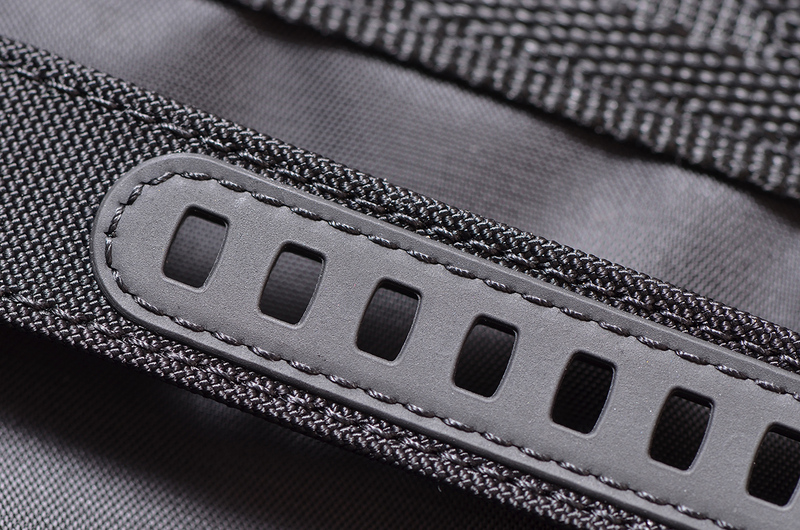 Replacing the strap with an aftermarket one should be easy enough. It takes a 21/18 strap and this tang buckle it also ceramic. It is in fact black but the flash makes it look somewhat grayish. I have very little experience with ceramic watches in general. I'm not sure how the others are finished. 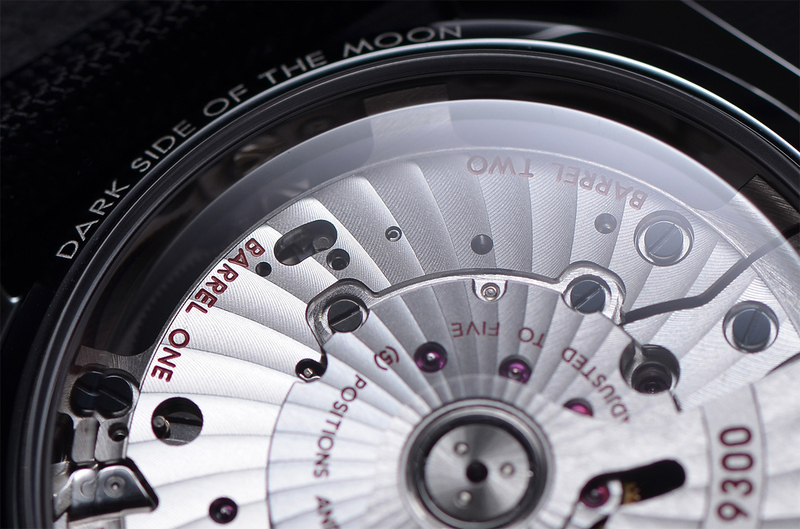 This one has both polished and brushed surfaces like most Omega watches. The crown is a bit stiff to pull out compared to the regular Moonwatches with Caliber 186X. 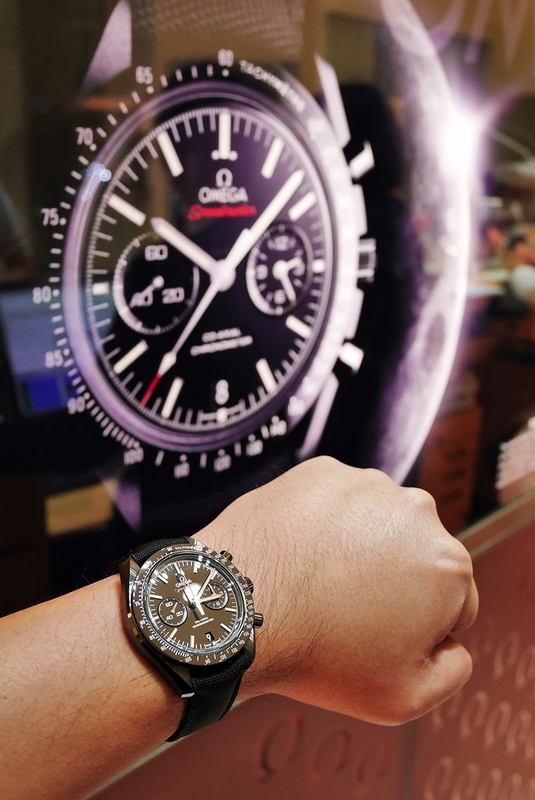 I asked and was told that it is normal for Speedmaster 9300. Maybe the other owners can share with me their experience? I don't want to yank at it too hard only to have the crown come flying out. Or maybe I need to grow some nails. Pulling the crown out looked effortless with the lady at the boutique. 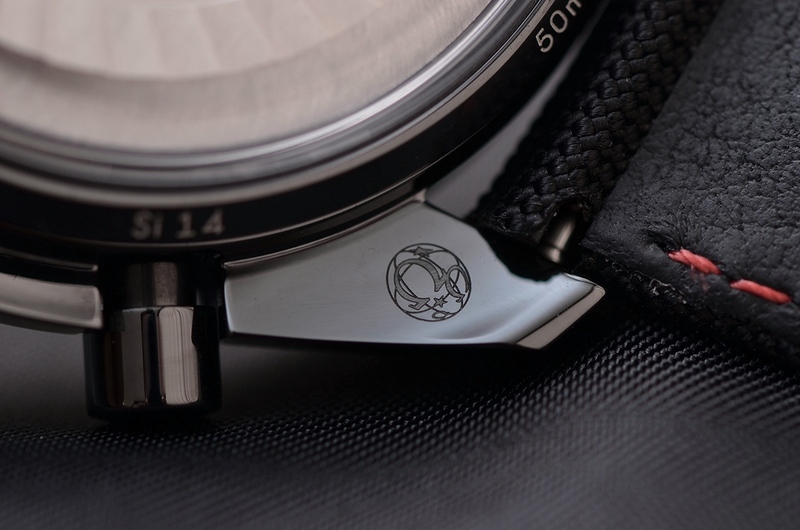 Not sure if this icon is on the caseback or on the lug for the regular Speedmaster 9300. The Dark Side has it here. All my other Omega watches are bought and worn on a bracelet. I didn't have a chance to take good photographs of the movement until now because the bracelet and the clasp were always blocking. You may see very faintly the "Si14" designation on the balance spring deep down. The two barrels that provide 60 hours of power reserve on this watch with 4-year warranty. And that's it for my highly emotional and minimally factual review of the Speedmaster Dark Side of the Moon. 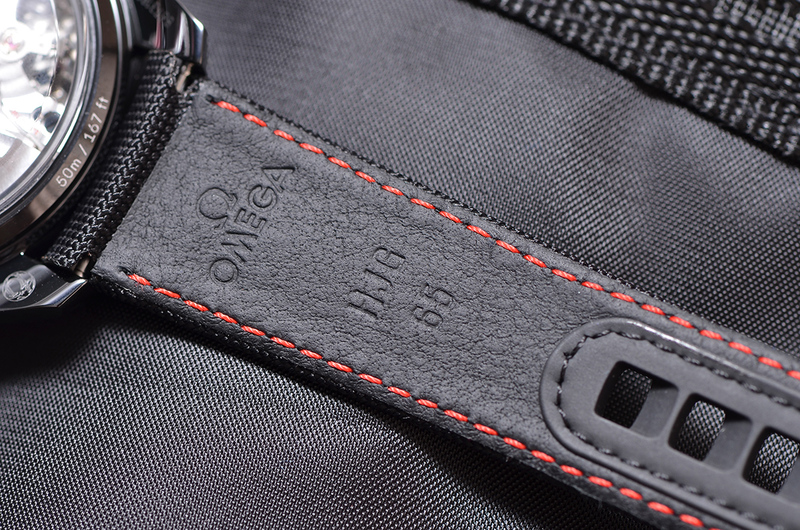 This is going to be my last unveiling of Omega purchase in maybe a few years. But surely I will stick around because you my friends are here. I will report back in some months how the watch handles daily wear, whether or not it is really scratchproof and so on. So far I think it is great with jeans but not with business attire because of the strap. 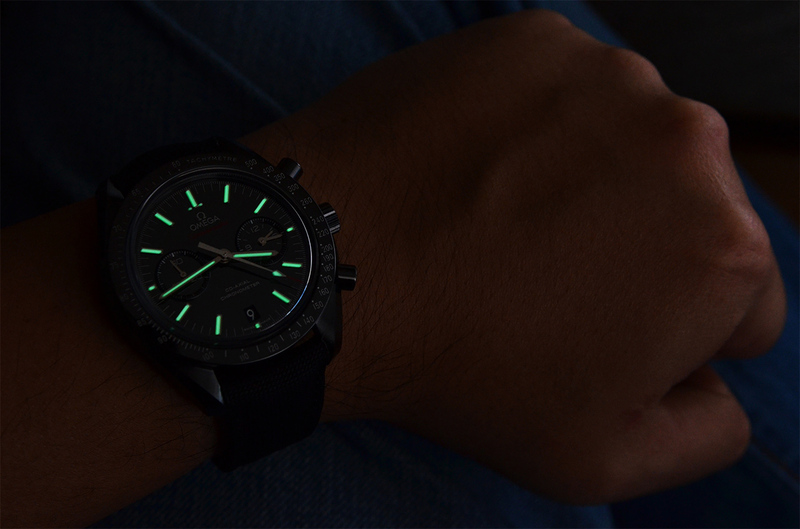 One would want to replace it with a black alligator strap to really wear the watch in a formal business environment. I have no such intention and will wear this watch on other occasions. It is cool and stealthy only those in the know like you guys would be able to tell its price. I like that. 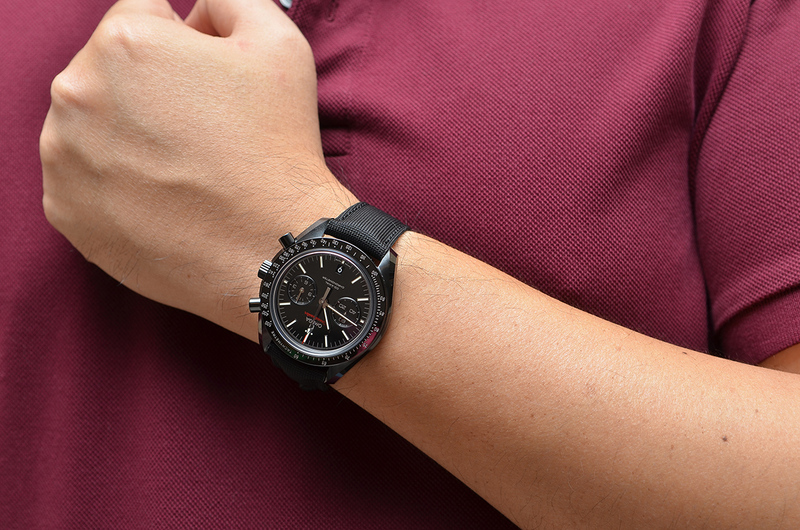 Next Topic: What have you been wearing on this Wrist Shot Wednesday?